Ford plans to test software and telematics on 20 Transit Custom plug-in hybrids to reduce emissions and lower costs in London. 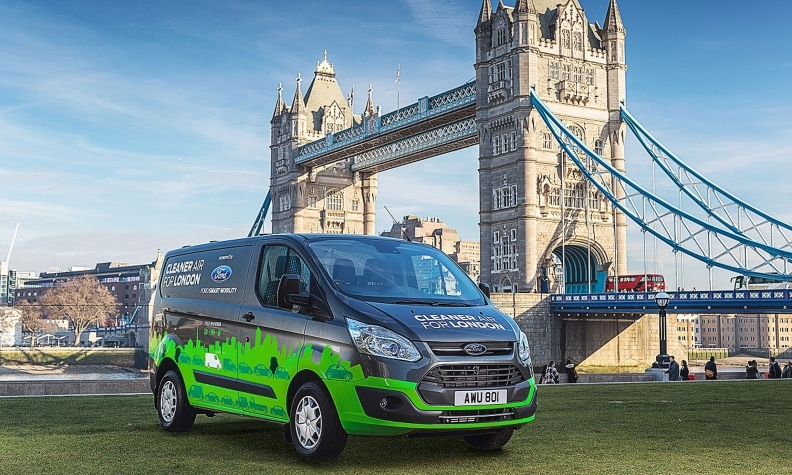 Ford Motor is teaming up with city officials in London to launch a year-long pilot program to test a fleet of 20 Transit Custom plug-in hybrid vans. The automaker earlier this month announced the plug-in vans as part of a $4.5 billion investment in electrified vehicles that will add 13 new products to Ford’s portfolio by 2021. The 20 Transit Customs for the pilot program will be built at Ford’s Dunton, UK, technical center. The vans will be available for commercial purchase in Europe in 2019; Ford has no plans to sell them in the U.S. The 12-month pilot, launching this fall, aims to reduce commercial vehicle emissions in the city. Such vehicles make 280,000 trips per day totaling 8 million miles, and vans make up 75 percent of peak freight traffic, the automaker says. Ford will provide the vans to a number of commercial fleet groups, including Transport of London. The pilot program is being financed with about $5.8 million (£4.7 million) from the UK government-funded Advanced Propulsion Center. Ford said the vans will get a pure electric range of about 31 miles. They will operate on electric power for most of their city-based trips, and will switch to the combustion engine for longer trips outside the city center. A Ford spokesman said there is potential to extend the pilot program to other European cities, although the automaker has nothing to announce now. Ford is partnering with BMW Group, Daimler and Volkswagen Group to create a high-powered charging network along major highways in Europe. The group expects to install charging stations at about 400 sites in Europe.